It was the turning point in her life. Inspired by her experiences, she trained to become a clinical hypnotherapist and left her job to pursue her new life goal: to teach other women the techniques which help them have a positive birth. The result was Natal Hypnotherapy, the UK’s leading provider of hypnosis for childbirth. The philosophy is simple: to help women have a better birth. Maggie’s work is revolutionising women’s birth experiences by teaching them to overcome fear and work with their bodies during birth. The facts speak for themselves: Natal Hypnotherapy users have an average caesarean rate up to half the national average and are recommended by 97% of users. Medical research has repeatedly found that hypnosis reduces surgical intervention, use of pain medication, mum’s pain perception, and labour times. It may not be on prescription yet, but Maggie’s work is already changing the birthing world. 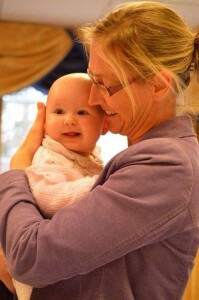 Thanks to Maggie, effective birth preparation is no longer only available for those with the luxury of money and time. Her range of self-hypnosis CDs and downloads for pregnancy and birth, and book “Effective Birth Preparation – your practical guide to a better birth” are accessible for everyone, and designed to fit into a hectic life. From terrified teenage mums to women planning their sixth home birth, the techniques have helped women from all walks of life have a more positive birth. Today, Maggie has personally trained over 500 midwives, has a network of practitioners who teach the techniques in comprehensive workshops all over the country, regularly appears as a birth expert across the media, and has used the techniques for the births of each of her five sons plus helping in excess of 100,000 women have a better pregnancy and birth experience! Please note that although Maggie does read all your comments there may be a delay in responding. If you have a query about Natal Hypnotherapy you may find the answers on the FAQ page.